Planet Fitness is known for being a Gym for everyone. We have the best personal trainers and staff in Dallas. Call us before Golds Gym, LA Fitness, and 24HR Fitness. 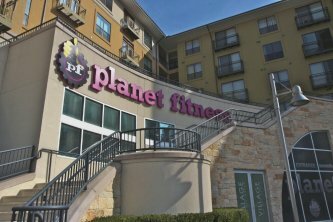 Planet Fitness is known for a lot of things - our absurdly low prices, our lunk alarm and most of all perhaps, for our Judgment Free Zone philosophy which means members can relax, get in shape and have fun without being subjected to the hard-core, look-at-me attitude that exists in too many gyms. We don't have any salespeople, and we don't bother with all the extras like juice bars and childcare that drive up the costs and can make a gym membership seem more like a car payment. Instead we've boiled our business down to the things that you really want in a health club - clean, stylish, hassle-free facilities that are filled with tons of brand-name cardio and strength equipment and a lot of happy people. If you're looking for a comfortable, friendly place to exercise, and you like a great deal, then you'll love Planet Fitness.